The update for the Portland, Oregon real estate market through March, 2019 is promising, and there were several gains in the housing market. However, the overall was cooler than in March last year. The good news is new listings were up a whopping 43.4% over February (which was an incredibly slow month) with 3,504 new homes hitting the market. Pending sales were also up some 24% over the month previous with 2,738 newly accepted offers. Closed sales were up 26.5% over February with 2,371 closings. All these numbers represented a slight decrease when compared to the same month last year. Inventory is now sitting at 2.2 months supply of homes with total markeing time now sitting at 68 days, and there are 4,808 homes on the market as of the end of March in the Portland metro area (not counting Washington). The average sales price is up 4.1% when compared to March of 2017 with our latest average sales price sitting right at $452,700 (the median is $400,000). 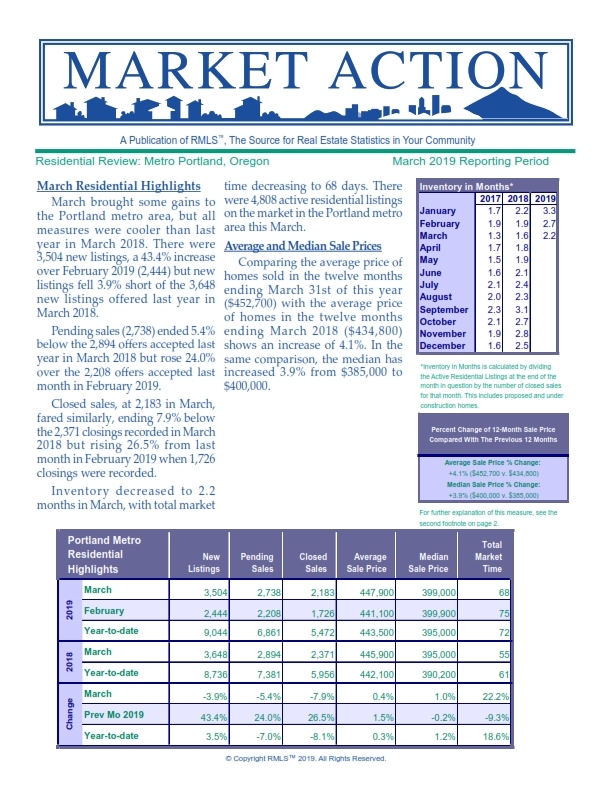 You can view the entire 7 page MLS report for all Portland metro areas by clicking here. Our featured home this month is a wonderful two bedroom condo off NW Skyline Rd. Super close in to downtown Portland and priced at only $254,900. You can see the condo here. The Portland metro area saw mixed numbers this December, but new listings made gains compared to December 2016. At 1,617, new listings showed a 13.8% increase compared to December 2016, despite a 33.1% decrease from last month in November 2017 (2,416). This was the strongest December for new listings in the Portland metro area since 2011, when 1,700 new listings were offered. Pending sales (1,757) exactly matched the 1,757 offers accepted last year in December 2016 but showed a 25.9% cooling from the 2,371 offers that were accepted last month in November 2017. Closed sales, at 2,350, ended with a 10.3% decrease from December 2016 (2,621) and fell 1.6% short of the 2,387 closings recorded last month in November 2017 as well. Total market time in December ended at 55 days, with inventory decreasing slightly to 1.6 months. Activity in 2017 was a little cool compared to 2016. New listings (40,805) decreased 0.8%, closed sales (31,624) decreased 3.6%, and pending sales (31,330) decreased 5.7%. Prices continued to rise in the Portland metro area in 2017. Comparing the entirety of 2017 to 2016, the average sale price rose 8.5% from $395,000 to $428,700. In the same comparison, the median sale price rose 9.5% from $347,000 to $379,900.Information courtesy RMLS. Portland 8th Best Place in America To Live! The new report is out from the Portland Business Journal... 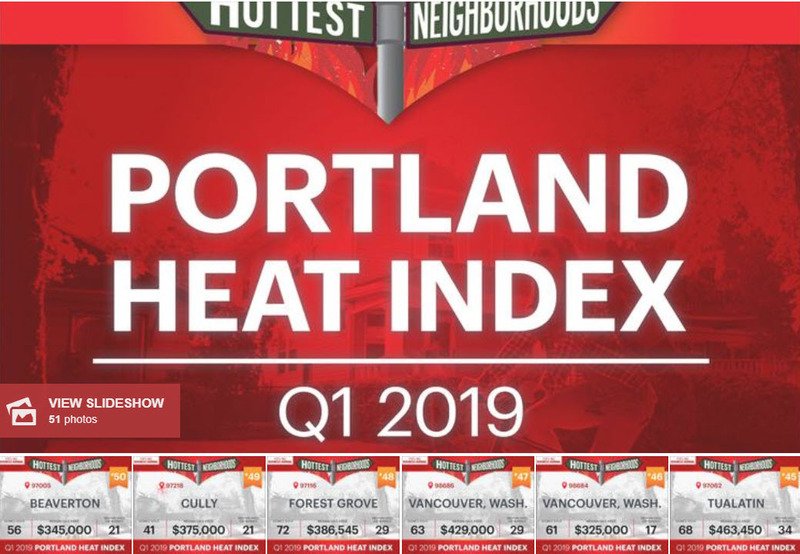 The Portland area's hottest neighborhoods for Quarter one, 2019 and the results might surpise you! A few teasers.... #25 Tigard, #15 Oregon City, #10 Beaverton 97006 and #1.... Beaverton again, zip code 97007 closely followed by Multnomah Village in SW Portland.